With this .40 S&W ammo in your concealed carry handgun, you can be assured of dependable results in a self-defense emergency. 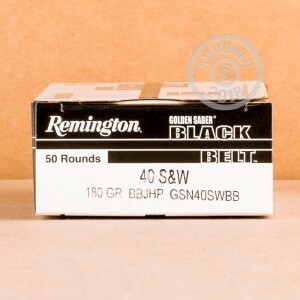 This ammo belongs to Remington's Golden Saber Black Belt series, a product line originally developed for law enforcement. Golden Saber Black Belt bullets are built with a MechaniLokt band that prevents core-jacket separation and facilitates reliable expansion upon contact with an assailant. 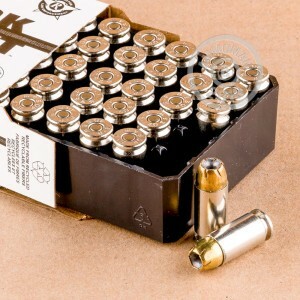 Each cartridge in this 50-round box fires a 180 grain spiral-cut jacketed hollow point bullet. The jacket is made of brass rather than the usual gilding metal and provides strong penetration--a key factor that affects the stopping power of defensive loads. 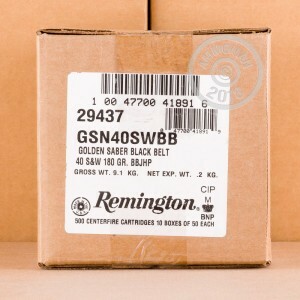 This .40 Smith & Wesson ammunition is made in Lonoke, Arkansas using non-corrosive Boxer primers and durable nickel-plated brass cases. Check out the rest of AmmoMan.com's selection and place an order for $99 or more to qualify for no-hassle free shipping!